…Tackling the T-shirt books, I quickly fell in love with Tease. I’m definitely a person attracted to books with pretty covers, and Tease doesn’t lack in that department. With its pallet of pinks popping out at you, it’s hard to pass by when making an impromptu book run. Edited by Sarah Sockit, the book features 50 projects from “superstars of art, craft and design.” Those superstars just happen to include Amy Sedaris, Todd Oldham, FredFlare originators, BUST editor and knitter deluxe Debbie Stoller and a host of Austin Craft Mafia members, just to name a few. You might think to yourself, “Self, can there really be 50 different projects to make with T-shirts?” The answer, after reading this book, is yes, and the projects go far beyond the revamped shirt. ReadyMade founder and editor-in-chief Shoshana Berger opens the book with a history of the T-shirt and the renaissance it’s finding with modern DIY crafters. The book features a set of clever icons, resembling washing/care instructions, that let the reader know difficulty levels, time commitments and needed supplies. The graphics allow the reader to look for projects based on their own skill level or time willing to give to a project, making it simple to find just the right project. Each project includes diagrams that help the reader with any questions about a step or what the piece should look like along the way. Each entry gives a brief description and photo of the author, as well as listing their own personal Web sites, an addition I found very useful if I wanted to learn more about the person or see what they made besides creative T-shirts. Each author includes a slight description about how she came up with her idea or how they came to become T-shirt reconstructors. With each author writing her own set of instructions, each individual voice came out, giving the book a very unique feel. What I enjoyed most about this book was the variety of ideas. There are plenty of revamped tops to pick from, but there are also lots of non-clothing projects to pick from. My favorites included the “Hula Lampshade” by Chris Bick and Keith Carollo, of FredFlare fame, “Souvenir Tee Bag” by Donna Jairdullo, “Placemats” by DeEtte DeVille and the “Soft-Tee Box” by Stephanie Wenzel. I tried the “Pillow Fight!” idea by Leah Kramer, Craftster’s reining guru. I loved the idea of taking some of my MANY old T-shirts and turning them into accent pieces for my chairs. Her instructions were dead-on and easy to follow. She provides a sewing and non-sewing version, two great alternatives depending on what your stitching skills happen to be. I used an old T-shirt from high school senior spring break (I know, I know. 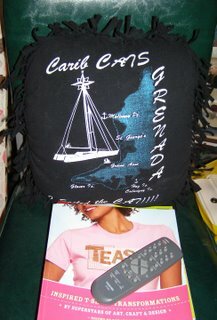 But I can’t think of any other time in my life I’d go to Grenada) that is too huge but too full of memories to toss. As you can see, it looks smashing against an old office chair in my bedroom. I think a set of funny old T-shirts would make a great housewarming gift for a friend or inexpensive way to accessorize your first apartment. Packed with colorful pictures and great ideas, Tease is a book any crafty guy or gal should have on the coffee table, ready and willing for a burst of creativity and a stack of your brother’s favorite T-shirts. To learn more about the book, check out the book’s home on the Internet and Penguin Books. Brought to you by Lish D.
Yeah for Tease! There are so many fun projects in there I don’t even know where to start.